Tye turned 8 today. 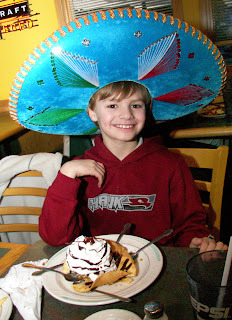 We took him to his favorite Mexican restaurant for dinner. And he was spoiled rotten with gifts, as usual. I can't believe I am a mother to an 8 year old. I was thinking today about what a great kid he really is and how having him has made me a better person. He has taught me to be kind, selfless, a teacher, more mature and responsible, and how to give a hug with more love than I could have imagined I could have. That is a great gift.